I’m not sure if I mentioned this, but I have a talking thyroid. This exceptionally chatty gland tells me a lot of things. For instance, it is very upset about having Hashimoto’s thyroiditis (a disease in which the immune system attacks the thyroid). It feels very persecuted. It tells me about its self-esteem issues. Recently, I started taking Armour Thyroid, because the Synthroid and compounded T3 I was taking before had stopped working. (Synthroid and T3 are synthetic forms of thyroid hormone, and Armour Thyroid is one type of natural dessicated thyroid, which is derived from animal thyroid, usually pig thyroid.) Natural dessicated thyroid (NDT) is supposed to be better for many patients. It not only provides the main thyroid hormones, T4 and T3, but also provides other thyroid hormones, such as T1, T2, and calcitonin, a hormone that regulates the amount of calcium in the blood and allows calcium to be absorbed into the bones. Natural dessicated thryoid is supposed to give the body what it would have if the actual thyroid gland were functioning properly. Unfortunately, I just had my first thyroid test after starting Armour, and my TSH (thyroid-stimulating hormone) was 13! WHAT?! The range only goes from zero to three, or zero to five if your doctor is old-school. My results indicated things were WAY out of whack. My T4 and Free T3 were within the normal reference ranges, but both were on the low side. So I called my doctor’s office, and he is increasing my dosage. I also posted in a Facebook thyroid group and found someone who had to adjust her dose three times before getting it right. So I assumed it was a dosage issue. Do you see what an obnoxious gland I have to deal with? Sigh. Seriously, has anyone else had a problem like this when starting Armour or another brand of NDT? It’s really scary. I just picked up the new dose of Armour, but I worry that it won’t be enough. Your thyroid speaks eloquently about what ails it. Makes me wonder if it’s been googling late into the night? Me, I hear voices too, but they don’t seem to be centered in the region of the thyroid. Sadly, it does not do its own Googling, but it is very selective about what it lets me Google. They don’t call it the “master gland” of the body for nothing. Love the cartoons 🙂 Have your symptoms been worsening since you started Armour? I know it is probably hard to tell, considering you have a plethora of situations that can cause similar symptoms. Do you feel comfortable with the level of dosage increase? Sending lots of low-TSH love your way. No, when I first started the Armour I was feeling so much better — less brain fog and more energy. Then it leveled off. My endo, who is a conventional doctor who is somewhat open-minded, told me that since I had felt better at first, my body had probably adjusted to the Armour and needed more of it. My LLMD, who is integrative/functional, thinks that my body might not be absorbing the Armour at all because of one of the fillers, and that either Westhroid, Naturthroid, or some form of compounded T4/T3 (mixed with a probiotic or Vitamin C )might work. Either way, they both want me to wait a month to see if the higher dose of Armour kicks in. Let’s hope that my TSH doesn’t go up to 40 by then! Seriously, I lost a lot of weight many years ago and I am NOT cool about gaining it back. I use a compounded T 3/T 4 combo. I can’t do the fillers in Armour. they can also be compounded separately, but at my pharmacy at least , they are synthetic if they are compounded separately. Interesting! I will probably end up doing that. So you are taking the combo T3/T4 in NDT, but just using a different filler? Good to have a sense of humor about it while you work it all out! 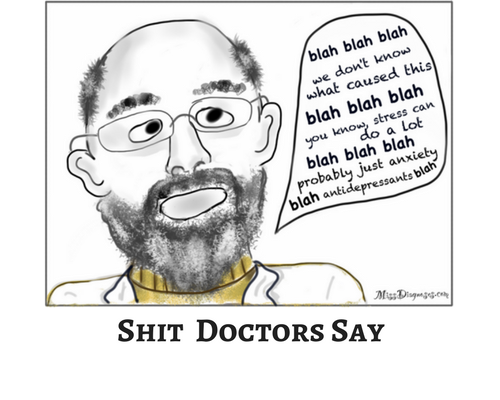 I am so grateful that whenever I look at a list of misbehaving thyroid symptoms, there are always plenty that tell my mine is behaving much more than not. I wonder if thyroid problems can be temporary, or if they are always on more permanent? Your brain on stun mode is better than many people’s brains at full capacity! I might’ve gotten the Hashimoto’s from endocrine disruptors, or it could have been hereditary (my mom has it). I think once you have it it is another one of those things that has to be “managed.” Ugh. I read that eating gluten makes it worse, because gluten molecules are similar to thyroid tissue and then your body starts attacking your thyroid more … anyway I have not touched gluten in forever (except one relapse) and it is worse than ever. I am sure endocrine disruptors make it worse, But I don’t think even moving to a deserted island would completely fix it. I think mild thyroid problems can be temporary, but my thyroid is pretty far gone by now. This was my first ailment. I should know tons and tons about it but I don’t. When you get something young you don’t research it. Well, I didn’t. Anyway, for years I popped a daily Synthroid and it was well-controlled. This year it seems to have gone crazy. I hope you quickly figure out a way to get things all smoothed out again. It’s true, before Google we had to actually rely on idiot doctors. I shouldn’t say that—my LLMD is good and so is my osteopath. And so is my dermatologist. The problem is they’re all expensive, because in New York the really good doctors that will spend more than 15 minutes with you either don’t take insurance at all, or you have to pay up front and your insurance company reimburses you later. I’m happy to have access to care and significantly less happy about how much I have paid for it. I actually can draw better than this and can make my thyroid NOT look like a bow tie, but WordPress doesn’t like my sketches done by hand. It seems to prefer the iPad sketch program, which is easier on my hands, although I can’t get the same precision (or any precision). And I want to make it look like a comic strip but I don’t know the program well enough to do that. I’m not great with technology. Hey, I’m thrilled you like to research environmental issues (although I am sad that it is because of necessity resulting from illness)! I have learned a ton from reading your blog. I learned about the BPA-free plastics issues from you before getting an emailed petition from the Environmental Working Group. As I get overwhelmed by email, I probably would not have signed the EWG petition (as well as yours) if I hadn’t read your post. The Mother Jones link was really scary. Actually, for anyone reading this comment here is the post I am referring to: http://lindasepp.wordpress.com/2014/03/15/petition-to-vitamix/. So great when we get the medical help we need and it works! That’s what I’m doing… I don’t get anywhere near the results I want in my mind, (the technology and my brain are both to blame there) but I’d drive myself crazy if I let that stop me from doing anything (and posting the often dismal attempts on my blog). Regarding the actual information I post, I really try to add something that feels empowering to most posts, otherwise it would be way too depressing. It’s hard since my camera broke. I don’t have a good (feasible) creative outlet now. I used to take all kinds of photos, most through my windows, the others were mostly within 20-50 feet of my door. I think at one time I knew how to do anything other than screen shots with Paint, and even knew a bit of Corel Draw (I still might have the 3″ floppy disks for that)… I need some kind of a creative outlet to get me away from all the research! I’m really curious to know how you get on with this. I’ve been on levothyroxine and liothyronine since thyroid ablation and it is the ONLY thing I’ve never changed since getting sick (besides my home). My blood tests are perfect so the doctors are hesitant to entertain the notion of changing to NDT or even brand name synthetic hormones. That’s a brave decision you made yo change! Wow, your levels are good on generic thyroid pills? I have never even heard of that! Great if you can get the same generic brand each time. None of the docs I know will even write for the generic. The brand-name thyroid pills are the only brand-name pills the insurance doesn’t fight me over. But if it’s working, great! I only switched because my endocrinologist recommended doing so, and Armour is supposed to work better, but so far for me it hasn’t, although it might be a dosage issue. I have several other options to try. It’s just hard to decide because the thyroid affects your ability to make decisions! Will definitely update. Well, the generic are working *on paper*. I’m mostly bedbound, so nothing in my body is actually working and I can’t help wanting to try different hormones. You’re very brave! Not really brave…am wondering if I should go back to synthetic now LOL. I think you were brave for switching doctors! Question: When they said your levels were good, did they mean within the range or at the high end of the range? Actually, I’m sure you already know this, but the Free T3 should be middle to high, the Free T4 should be middle to high, the TSH should be on the low side, etc. I felt the best when my T3 was a one but everyone is different. Right now I feel like crap. 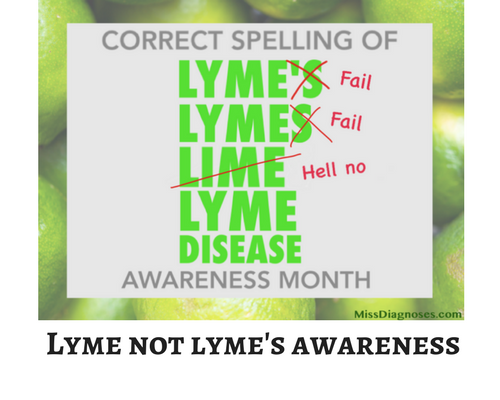 On a different subject, I think a lot of my allergies and histamine issues are related to the Lyme, because my body is fighting the Lyme bacteria so the reactivity to everything else goes up. It is that whole theory with the bucket that you discussed … the Lyme kind of partially fills the bucket so your tolerance for everything else is shot to hell. 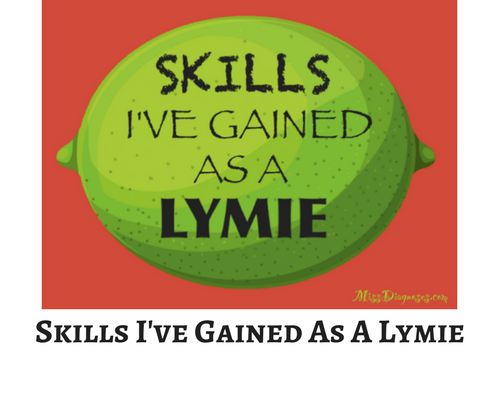 I read a few Lyme blogs where people were having problems with histamine issues.